One of the entertaining things we are blessed to do while traveling around our magnificent, beautiful, and astonishing country is to see wonderful, unusual sights, and along the way pick up some little known tidbits of wisdom and experience an ahhhha moment. Recently, we experienced one of those ahhhha moments in the least likely place. 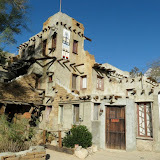 Cabot’s Pueblo Museum, located in the Coachella Valley, here in Desert Hot Springs. First let me say something about the Museum and its’ builder, Cabot Yerxa. Before settling in the California desert, Cabot led an adventurous life. In 1913 he homesteaded 160 acres in what is now Desert Hot Springs. Pressed for water, he dug a well with pick and shovel, discovering the now famous hot mineral waters of Desert Hot Springs. Nearby, through a second well, he discovered the pure cold water of the Mission Springs Aquifer. These two wells, hot and cold, give the area its name – Miracle Hill. Cabot began construction on the Pueblo in 1939 and worked on it until his death in 1965 at the age of 81. The Pueblo was abandoned after Cabot’s death. A Desert Hot Springs businessman and acquaintance of Cabot, Cole Eyraud, purchased the property and helped restore the Pueblo to its historic state. After his death, the family donated the property to the city, and it is now a historic museum and art gallery. The museum is filled with artifacts, art work and personal memorabilia. You are not allowed to take interior photos, but I am sure you get the idea from the exterior photos of the building and surroundings. ha ha. . .good one on the weather rock!